At least 100 dogs and cats are in my workplace every day; hereÔÇÖs how we make it work for all. 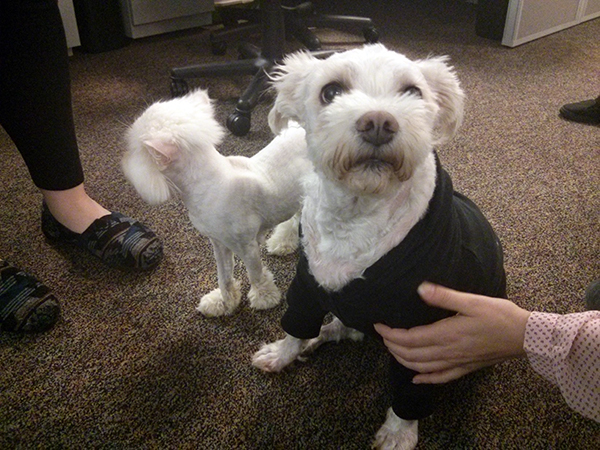 I never imagined I’d be lucky enough to work in a place where my colleagues and I can bring our pets to work. 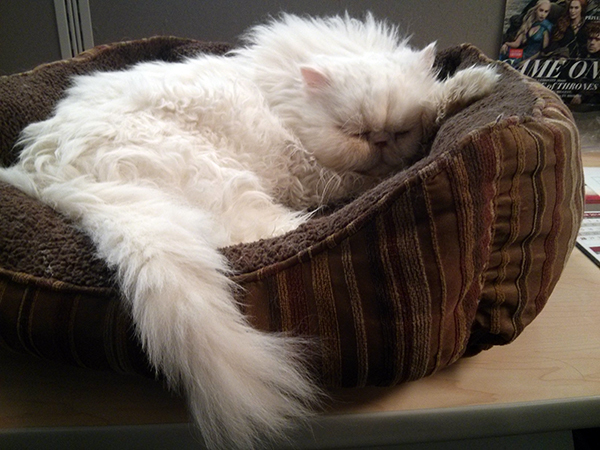 Office cats and dogs are stress relievers, icebreakers, and emotional support. Pets who are easygoing and well-socialized have lots of fun meeting new people, too. As pet-friendly workplaces become widely accepted, it’s important to plan and set guidelines to minimize the risk of misunderstandings or disasters. It’s a matter of pet care as well as being considerate to humans. Given that I work in an office that could contain 400 people at any given time, planning and protocol are especially important. 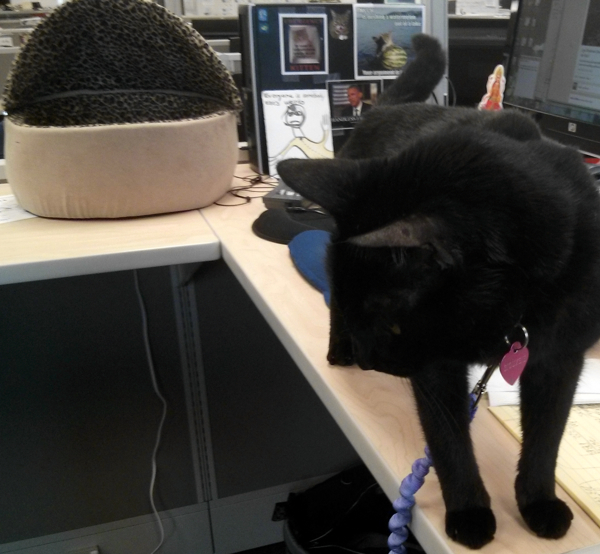 Here are some of the things we do to make sure the office pet experience is good for everyone. The pet application is a questionnaire about the pet’s behavior, health, and attitude toward other pets. 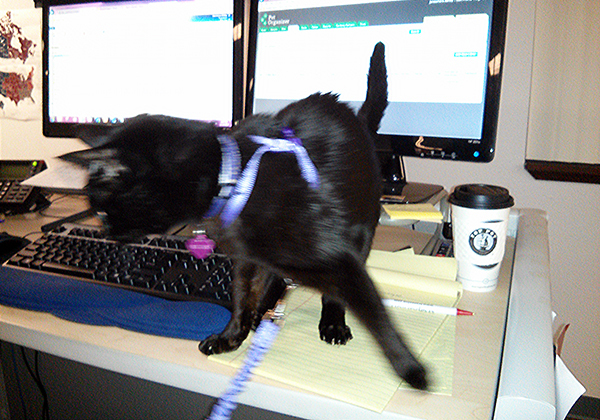 When I filled out my application to bring my cat, Siouxsie, to the office, I answered questions about her experience with dogs, noisy environments, and new circumstances. The medical records let us ensure the pet has been cared for responsibly and is in good health. All pets that come to my office must be spayed or neutered, current on their vaccinations, and must be on an approved monthly flea-control product. That said, vaccine waivers can be acceptable under certain circumstances. Pets can’t come to the office if they have a contagious illness. The pet team is a group of employees who volunteer their time to review pet applications, research medical records, evaluate new office pets, mentor employees who bring their pets to work, and deal with concerns or pet-related incidents. Pets must pass a behavior evaluation similar to those used in animal shelters, in which we document dominance, aggression, and level of socialization. We have new pets interact with dogs and cats in the office so we know how they respond to other animals and to the environment. Having a pet in the office is a privilege, so pet parents are expected to follow the rules. If they don’t, or if their pet is a distraction, they can lose their pet privileges. Employees know they can contact a pet team member and confidentially discuss any inappropriate pet (or owner) behavior issues. I work at a pet insurance company, and my office is full of licensed vet techs, vet assistants, and shelter volunteers as well as a few veterinarians. If a pet has an emergency, my office is the second best place it could happen — the first best place being a vet clinic, of course. If you plan to make your workplace pet-friendly, here are a few things to consider. 1. 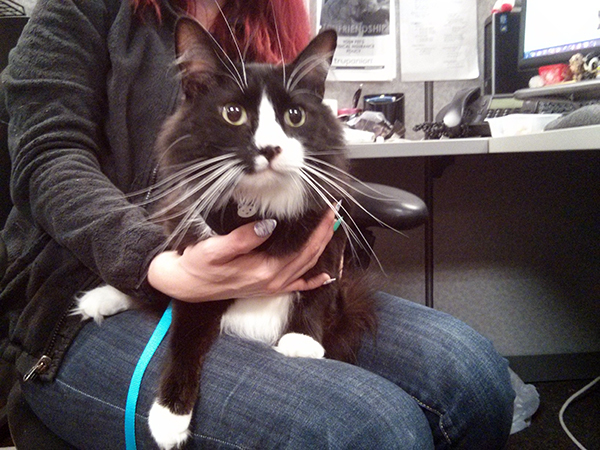 Do any colleagues have pet allergies or other medical issues? Pets might do more than just make life unpleasant for some of your co-workers. They could cause legal problems if there is the potential for an allergy-related health emergency or safety problems for mobility-challenged colleagues or clients. 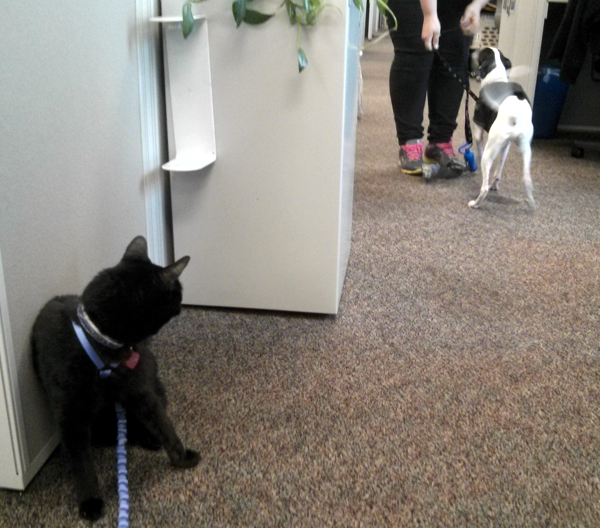 A severely pet-phobic individual might feel that dogs or cats in the office create a hostile work environment. 2. Do you have a plan for pet emergencies? It’s helpful to cultivate a relationship with a nearby veterinary clinic and have colleagues who are certified in pet first aid and CPR. Be sure there’s a place where employees can evacuate safely with their pets in the event of a fire or other disaster. 3. Do you feel comfortable saying "no?" Not all pets belong in an office. If a pet’s behavior evaluation is unsatisfactory or if he or she becomes a problem for people or other animals, you must be able to tell an employee they can’t bring their pet to work. Is your office pet-friendly? What does your employer do to create a good environment for pets and people? 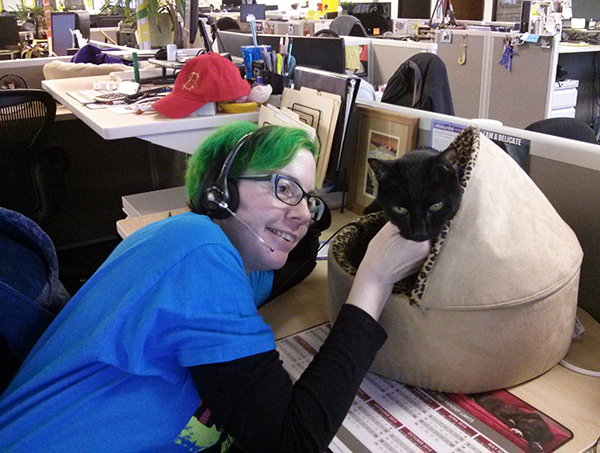 Have you brought your cat to work? How did she like it? Share your thoughts in the comments! Read more by JaneA Kelley.